Please refer to our stock # ESC1 when inquiring. These gorgeous vintage earrings were designed by jeweler, Patricia Von Musulin. Her pieces are known for their sculptural quality and have been featured in the design collections of Bill Blass, Perry Ellis, Oscar de la Renta, Michael Kors, Ralph Lauren, and Geoffrey Beene. 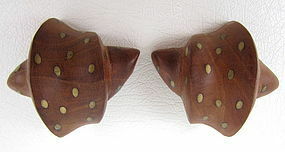 They are hand carved from lignum vitae wood and have brass dot details. The reverse clips are sterling silver with a gold vermeil, and each is hallmarked "Von Musulin Sterling". They are in excellent condition.